We’re tempted to believe we’ve had our “fill” of Jesus, that we’ve learned all we need to know about Him and from Him. The church needs reformation when it believes it has had enough Jesus. When the church doesn’t proclaim Christ in truth and power, people may listen but they don’t hear Him. They don’t see their sin or the cost of discipleship. If the church today is to experience a true reformation, we must return to the basics, to the teaching of Christ in the Gospels and the rest of Scripture. Ligonier Ministries seeks to help the church preach Christ. As we close 2013 and look forward to 2014, by God’s grace, we will raise enough support through you by December 31, 2013 to put us on solid footing for the next year of outreach. 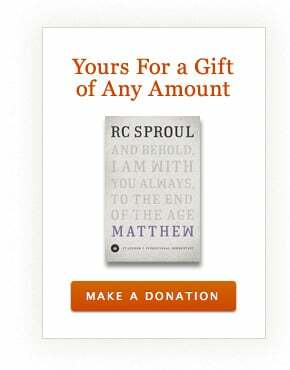 Your gifts make ministry happen and it’s critical that we end 2013 strongly. For your gift of any amount this month, we will send you my newest commentary, Matthew, in the St. Andrew’s Expository Commentary series. This book was written to assist believers in their study of this Gospel, and your donation will get this work in your hands and help us produce more resources like it. Thank you. Note: Offer expires 12/31/13. Please allow up to 6 weeks for delivery after your gift is processed. Contributions are tax-deductible as allowed by law. For federal income tax purposes, the deductible portion of your charitable contribution is limited to the excess of the money contributed over the value of the goods provided. Our good faith estimate of the value of this resource is $48. Offer valid in U.S. and Canada only. Thank you for your support.